A Labour Party MEP has died of a heart attack in a Derbyshire hospital. 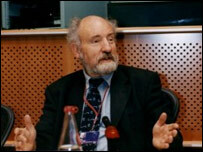 Phillip Whitehead, 68, a former chairman of the European Parliamentary Labour Party, was re-elected East Midlands MEP in June 2004. Prime Minister Tony Blair said he had "worked tirelessly in fighting injustice and campaigning for greater consumer and welfare rights". Mr Whitehead had worked as a television producer in the 1960s on This Week, Panorama and ITV's The World at War. Mr Whitehead was taken ill at his home near Matlock in Derbyshire on New Year's Eve and died later in hospital at Chesterfield. He read philosophy, politics and economics at Oxford and was president of the Union in 1961. The Labour Party website said he had "played a leading role in European consumer legislation" and helped develop laws on financial services and timeshare. He twice authored the parliament's blueprint for consumer action plans. Deputy Prime Minister John Prescott said: "Phillip was a life-long campaigner for the Labour Party and Labour values. "He committed himself to working non-stop for people in the East Midlands, first at Westminster and then at the European Parliament." He was Labour MP for Derby North from 1970 to 1983 and helped introduce acts on police complaints, adoption and family planning. He was presented with a Solidarity medal by Polish union leader Lech Walesa in November 2005. Mr Whitehead was an active member of the RMT Union and a member of the National Union of Journalists since 1961. He was married with three children and three grandchildren.